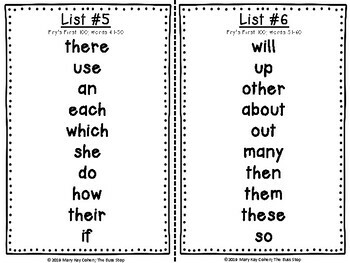 This resource has everything you need to progress monitor your students on sight words. 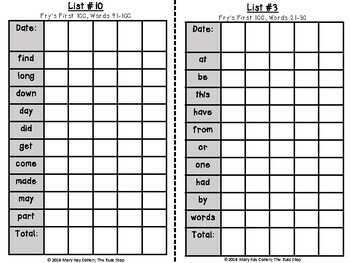 It includes all of Fry's First 100 words broken down into 10 individual word lists to make it easier for you to test your students. 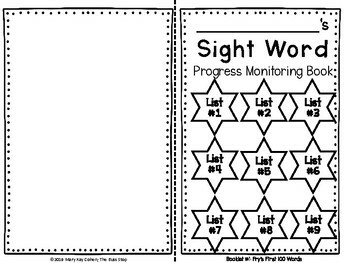 To use this resource, you print out a sight word progress monitoring booklet for each student. They are easy to make. Just print, fold, and staple! Inside each booklet contains a recording sheet for each of the 10 word lists plus one review list. The cover of the booklet has a star for each word list. The students color the star when they master that list. It's a great way to celebrate your students' success and a good snapshot of which word list they are working on. 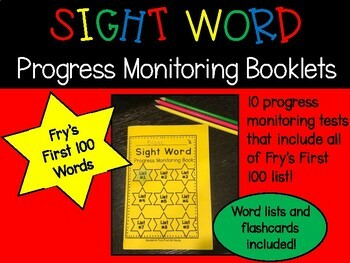 This resource also includes flash cards for all of Fry's First 100 words.